Crystal plans to turn Becker Park, the city’s first public park, into a destination park with a new playground, splash pad, and more. The park originally opened in 1948. Previously, the park had a softball focus with several fields and a signature summer softball tournament. Changes include building a 14,000 square foot inclusive playground, a splash pad, running trails and an ice skating rink. The city hopes the park’s use will increase dramatically. 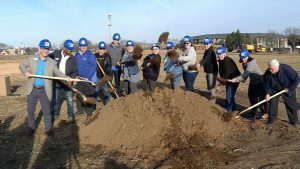 The ceremonial groundbreaking held on Wednesday, April 3 kicked off construction that will now wrap up until summer 2020.